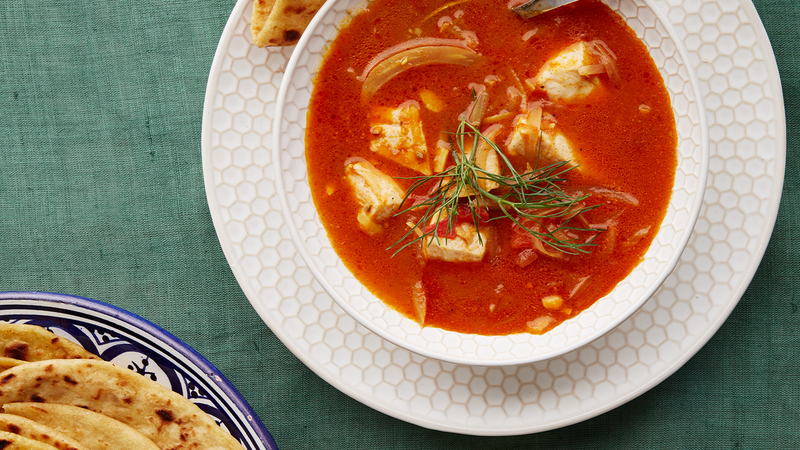 This curried swordfish stew recipe appears in the "Stews of the Arabian Gulf" episode of Martha Stewart's Cooking School. Heat ghee in a large Dutch oven over medium. Add onions and sliced fennel and cook, stirring occasionally, until golden brown, about 15 minutes. Stir in tomato paste, cumin, and spice blend and cook until aromatic, 1 to 2 minutes. Add garlic and serrano and cook 5 minutes. Add tomatoes and 2 cups water and bring to a simmer. Season fish with salt and pepper and add to pot. Simmer, uncovered, until fish is cooked through, 8 to 10 minutes. Add lime juice and season with salt and pepper; gently stir to combine. Ladle stew into bowls; garnish with fennel fronds. Serve with lime wedges and flatbread, if desired.